Congratulations to Angela Nicholson a PhD student in Biological Sciences at UC San Diego, who presented a research talk entitled "RNA Regulation: The Tail Wagging the Dogma". 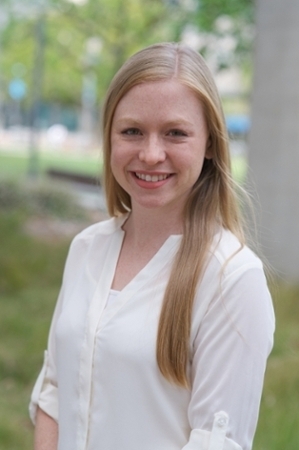 Angela now will represent UC San Diego at the the UC Systemwide Final Round on May 10th in San Francisco. Can you present your research in just 3 minutes? Grad Slam is the competitive student speaking event that gives you the chance to showcase the impact of your research. Bring your work to the forefront of a live audience to share what you already know, that your research is cutting-edge, breaking barriers, revolutionary and give examples of how your contributions will make an impact. Not only will you master the skill of delivering your academic story in a dynamic way, but winners will also take home prizes ranging from $100 to $5,000. The top presenter will participate in the UC system-wide Grad Slam competition in San Francisco, with all expenses paid. This event will propel your professional communication skills to new heights. Your research is important to the world, now it’s your turn to tell us why! Congratulations to the top ten students who presented engaging 3-minute research talks at Grad SLAM 2018. Learn to communicate the impact of your research in three minutes or less and win prizes.